Most parents, at some point during the night, sneak into the room and listen to their children sleeping as they check to make sure they’re safe and sound. For many parents, it’s the only time they manage to see their children peaceful and quiet. Unfortunately, there’s been a rather alarming increase in childhood snoring as well as sleep apnea that has many parents afraid for the health of their children. The rise in childhood obesity is a definite issue to consider when evaluating possible causes in the rise in childhood snoring as well as sleep apnea. It’s a very logical explanation, particularly in light of the correlation between obesity and apnea in adults. There will probably be greater numbers of reported snoring among children who are overweight as well as an increased number of cases where apnea is present. There’s another possibility that is being given some considerable attention as well. NBC reported that some instances of sleep apnea in children could be the direct result of fewer tonsillectomies being performed. The vast majority of sleep apnea cases are obstructive sleep apnea, which means that something is blocking the airways. It’s a logical conclusion that tonsils can be the culprits in many of these cases. Children who would have had their tonsils removed in decades past are keeping them, only to find that larger problems loom as the result. 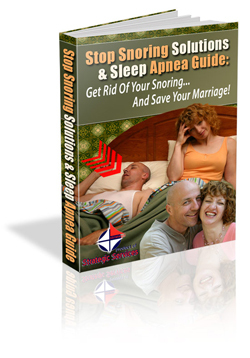 Snoring in and of itself isn’t dangerous and there can be numerous reasons why your child is snoring. He or she could simply have a cold, which inhibits their ability to breath. You could also find that your child is sleeping in a position that doesn’t provide the best possible environment for deep breathing that’s associated with sleep. Don’t panic if you’ve heard your child snoring for a night or two - just begin to pay attention. If he quits breathing during the night and suddenly gasps for air or he’s becoming more and more tired throughout the day, you should consult your doctor immediately to rule out the possibility of sleep apnea. Childhood sleep apnea is more than a health problem, though that alone is enough to worry most parents. It can inhibit learning and proper growth. A good nights’ sleep is vital to growing bodies and if your child isn’t breathing properly, he isn’t getting that restful sleep that’s so important. A short attention span is one of many problems. This often exhibits itself in manners that are seen as behavioral problems and an inability to focus and concentrate on lessons and in school. Other problems that are associated with childhood sleep apnea include high blood pressure, obesity, and on the opposite end of the scale, an inability to gain weight properly. Sleep apnea in children is no laughing matter. If you suspect that your child may have this problem, you should seek medical care immediately. If nothing else, you can work to rule out this life threatening condition and obtain peace of mind. Otherwise, you have discovered the problem and can begin treating it before it’s too late.